I put down a large, green bag. And a pot. ‘Beans,’ growls Tijm. He looks angry. He does not like green beans. ‘No, peas,’ I correct him. Tijm shakes his head. Peas are green, but little and round. Not long and thin. I show Tijm, I crack the pod and it’s treasure rolls out. Linde comes running as well and soon all three of us are hard at work. Four toddler hands break open the beans and peas are rolling everywhere. ‘They are supposed to go in the pot,’ I point out. Most of them do. The pods go in the strainer. Baby Jasmijn comes crawling. The strainer intrigues her. She pulls, shakes it, and boom, it tumbles over. Jasmijn gets covered in a wave of pods. Surprised her blue eyes look at me from under the green. She shakes her head, shakes off the pods and grabs one from her hair. Curious she eyes it and sticks it in her mouth. She nibbles and chews the pod. 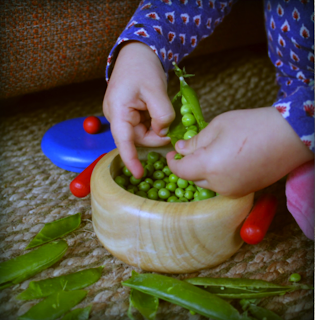 She fiddles a pea between her fingertips and puts it in Jasmijn’s mouth. Linde agrees and gets her little pan, she fills the saucepan and Tijm rushes to get his own, a frying pan. 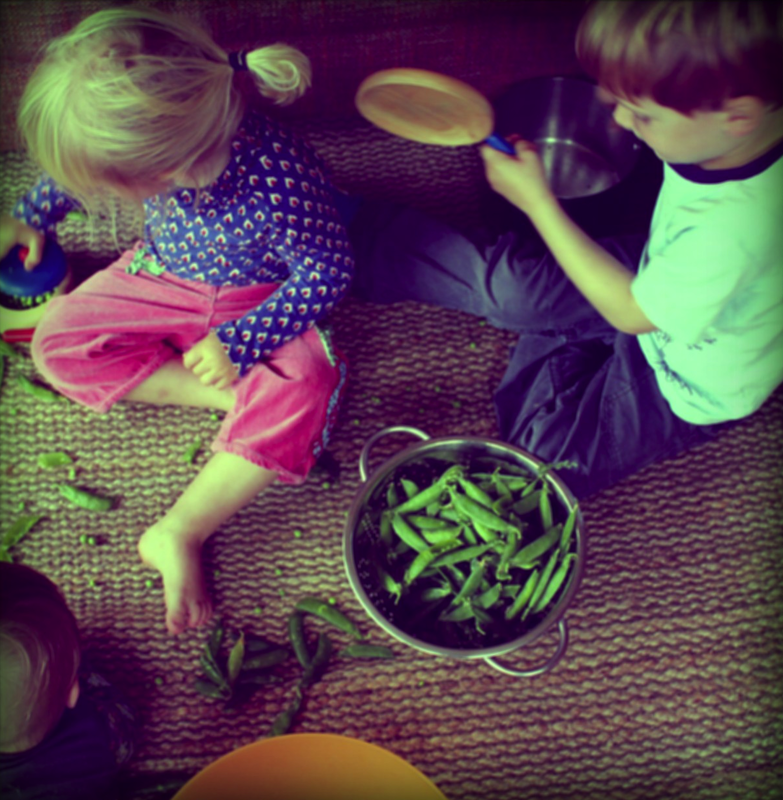 They cook and stir and fry, all the lovely peas, while I keep podding until the bag is empty and all the pots full. Now we are really going to cook! 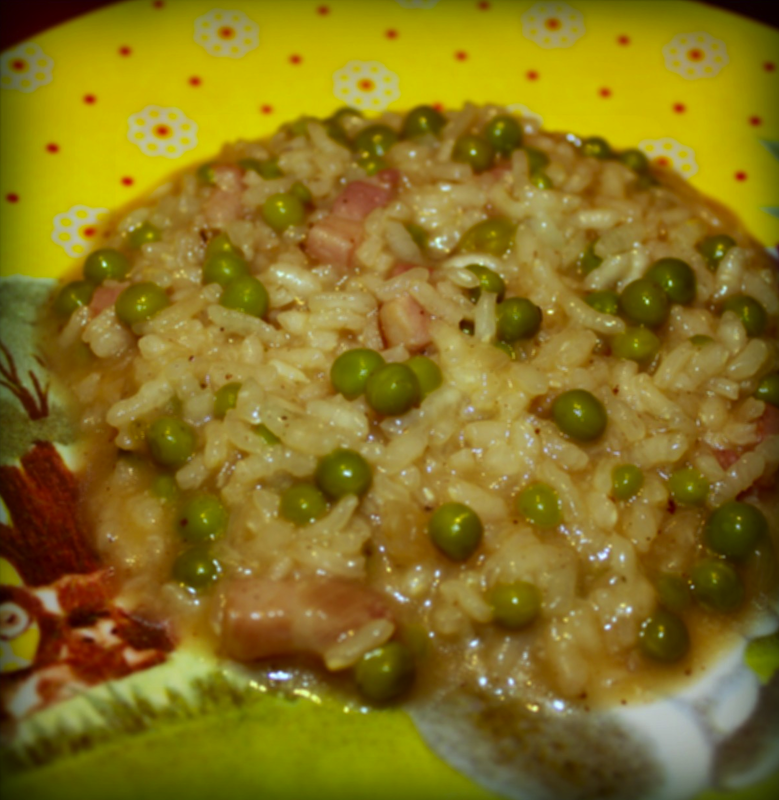 We make risi e bisi, a venetian recipe. It is a mild, creamy risotto, and very easy as it does not have to be continuously stirred since that would break up the peas. Cut the onion in little pieces and fry it in a bit of oil. When it get’s transparent add the pancetta and fry a few minutes more. Add the rice and fry this as well, stirring thoroughly to coat every grain in some oil. This will protect the grains from leaking too much starch when we add the broth. Then add the peas and ladle by ladle the hot stock. Stir after every ladle. You should add some stock and stir every few minutes, until the rice is cooked. That should last about twenty minutes. The risotto can stay fairly fluid, but should not become a soup. Creamy and runny it is at it’s best. When the risi e bisi is ready add a good handful of parmesan cheese and pepper and salt to taste.